Meneham claims to be the Messiah. The Jews in Caesarea lose their basic rights, are mocked and ridiculed by Romans, and the local synagogues are defiled. Riots ensue. Multiple Jewish sects are now fully committed to the liberation of Judea. Eleazar convinces his father, Ananias High Priest of the Temple, to end daily sacrifices for the Roman Emperor. Procurator Florus abuses his authority and further enrages the Jewish citizens. A small group of Jews mock him and in return Florus crucifies and executes innocent bystanders. In the end, Florus executes about 3600 people including city officials, Roman citizens, women, and children. Menaham and the Sicarii infiltrate and defeat Roman forces located in Masada, a fortress built by Herod the Great. Menaham returns to Jerusalem with enough weapons to start a war (wink wink). Josephus (at the time still Jewish) attempts to convince his counterparts not to rebel. Menaham and his Sicarii return to Jerusalem and vanquish the Roman garrison. Roman survivors are given permission by the Zealots to leave the city unharmed. Menaham demands their deaths and on the Sabbath, the holiest day of Jewish religion, slaughters those whom were promised life. The Sicarii go as far as to kill the High Priest Ananias for attempting to make piece with the Romans. Menaham claims himself as Messiah and Absolute Ruler. This completely contradicts Jewish Law (Remember that whole "King of the Jews" thing?). Eleazar son of Ananias and the Zealots torture-execute Menaham. The Sicarii are banished from Jerusalem and take refuge in Masada. The First Jewish-Roman War has begun. It was only a matter of time before the Roman Legions crushed all Jewish opposition. 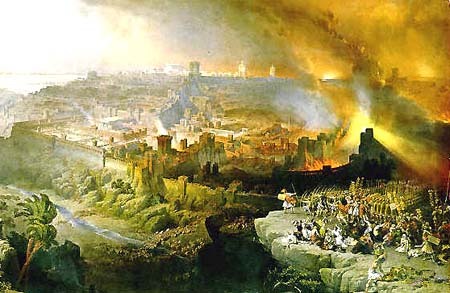 Starting with Jerusalem, four legions (approx 20,000 soldiers) went from city to city driving out Jewish revolutionaries. Along with the Sicarii, those that managed to survive eventually made their way to Masada, the last standing symbol of Jewish liberty; even Eleazar had resorted to taking shelter there. He was welcomed and inaugurated as leader. In 72 BCE the Roman Legion began the siege of Masada. General Lucius Flavius Silva, commanding legion X Fretensis, wanted to break down the walls of Masada and bring an end to the Jewish rebellion. Unfortunately, the only way into Masada was a small path, barely large enough for a horse to travel on, that winded left and right all the way to the plateau. General Silva ordered his men to build a 375 foot ramp allowing the legion to march up to the walls of Masada. Upon ramming open the gates, General Silva discovered the Zealots and Sicarii had committed mass suicide. The only survivors were two women and five children who managed to live by hiding inside a cistern. Josephus states that the followers of the Fourth Philosophy decided upon death rather than becoming subject to unrelenting torture or slavery to a idolatrous empire. "Masada shall not fall again!"